Planet Neptune in astrology governs many diverse qualities. Neptune can cause nervousness as well as restlessness. Socialization can lead to successful business transactions and even blossoming relationships. Neptune also rules over camouflage, spirituality and hidden meanings as well. Neptune especially favors those who work in sales, with people, or in some creative means. If you have one of these jobs, then you should be especially blessed when Neptune is in your zodiac sign. Neptune can be positive for some people and negative for others. However, the planet generally carries a little bit of bad and good with it. Aries are naturally romantic as well as good business men and women. Aries will have even more luck in love and business (or school) when Neptune is in this sign. Just remember to stay social with your coworkers and partner if you want to succeed. Taurus is not dominated by Neptune, but can still feel it’s power every once in a while. Neptune in Taurus people may feel more depressed than usual. They might also feel more nervous more often about their job or relationship status as well. Gemini may only be slightly affected by Neptune’s power. It is likely that they well fare better at work or school, but they may be more nervous and high-strung when it comes to social situations. Make sure to watch yourself while you are with others. Neptune in Cancer, unlike Gemini, should experience better romantic interactions. However, their artistic side could suffer. This will be both with ideas of new art to make, having difficulty making something once they have the idea, and even having a hard time trying to sell their art once it is created. Leo will have a difficult time when Neptune is in its sign. Already fast to anger if annoyed, they will be on edge and likely to be upset more easily if irritated. However, if they can manage to control their emotions, their job or schooling should lead them to success. Virgo usually takes on many tasks at a time, but this may not be a good idea when Neptune is in your sign. Taking on too much will likely lead to stress, and loss of sleep over the things that they could not get done. This may set off Virgo’s usually helpful and peaceful personality. Libra will feel more nervous about romantic situations when Neptune is in this sign. However, a Libra Neptune person should thrive in business or at school. Do not forget about your natural flair for romance, as this will help you to fight through your nervousness. Scorpio tend to be strong individuals, if not in body than in mind. When Neptune is in this sign, Scorpio may feel a more creative drive than it is used to, but this new train of thought may lead to unease. Take advantage of your new ideas, and try not to get too worked up over them. Sagittarius, great at making friends and interested in the pursuits of the mind and of artistic nature, will have a great time when Neptune is in its sign. Take advantage of this, as your already great skills will be even more enhanced with Neptune in Sagittarius. Capricorn are hard workers and are usually seen in the extremes of emotions. This should cause a Capricorn to have a great time at their job or in their schooling. However, it could also mean obtaining the burden of anxiety as well. Try not to let your anxiety interfere with your work and you should succeed. Aquarius is a sign full of many successful people. 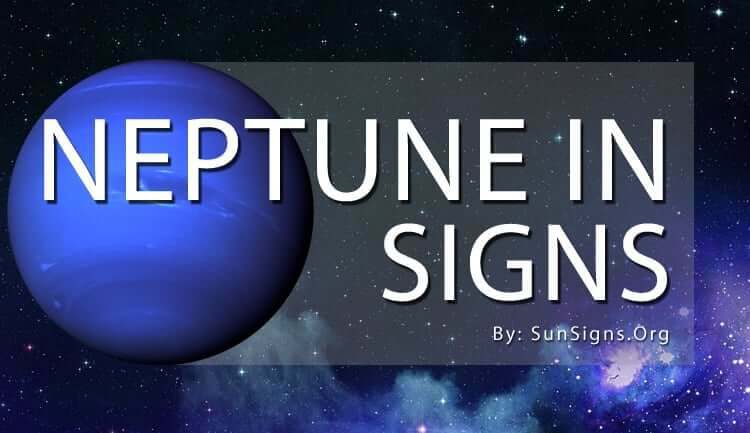 Neptune may make someone more creative or better at business when it is in this sign. Following these strengths can lead any Aquarius into a successful life. However, ignoring your new-found skills won’t get you anywhere. Pisces are prone to mood swings, and this trait is likely to be exaggerated when Neptune is in this sign. The Pisces life may be fraught with anxiety or it could go the other way and give them a change to becoming an even better socialite. It all depends on how the individual reacts to Neptune.